Though it might not seem like it today, Mars once had an atmosphere thick enough to sustain liquid water on the surface. It isn’t entirely clear what happened over the last four billion years that changed those conditions, but NASA’s Mars Atmosphere and Volatile EvolutioN (MAVEN) orbiter will attempt to find out by studying what is left of the red planet’s upper atmosphere. MAVEN reached Mars on September 21 and though it is still making adjustments to its orbit and turning instruments on, it has already sent back the first data describing the variable composition of the upper atmosphere. A contributing factor to the loss of the martian atmosphere is believed to be high-speed solar energetic particles (SEP). During times of solar activity, such as during flares or coronal mass ejections, SEPs can shoot out from the sun and potentially help strip away the atmosphere of Mars. 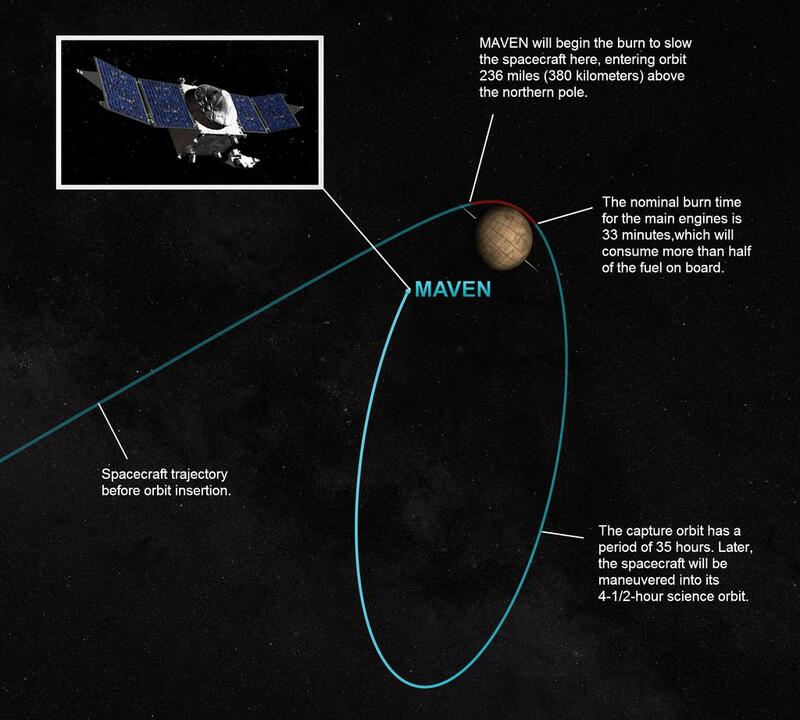 MAVEN has an instrument to detect and study SEPs and wasted no time. Days after MAVEN entered orbit, a solar flare kicked out SEPs that reached Mars on September 29. The upper atmosphere is the final barrier that prevents this material from escaping into space. It is very thin, and held together by the red planet’s gravity, which is only 38% as strong as Earth’s. Using the Imaging Ultraviolet Spectrograph (IUVS), the team was able to construct an ozone map (pictured above) of the carbon, oxygen, and hydrogen within the upper atmosphere; the three products of the breakdown of carbon dioxide and water. Tracking these molecules can help scientists understand how the atmosphere is being stripped away, and thus how the conditions of the surface of Mars have changed so drastically over time. The map revealed to scientists that the atmosphere of Mars is highly variable. This commissioning phase, where MAVEN is making adjustments and testing out instruments, will continue for another two weeks. In the first week of November, MAVEN will begin the primary science mission which is expected to last for one Earth year. NASA’s Mars Atmosphere and Volatile EvolutioN (MAVEN) orbiter entered into Martian orbit in September and began its primary science mission in mid-November. The goal of the mission is to learn why the atmosphere of Mars depleted, which is a large factor in why the planet is no longer able to support liquid water. Some of the earliest science results that were returned have indicated that solar wind may have punched holes in the lower atmosphere of Mars, which could have helped contribute to the depletion of the atmosphere. The results were presented by MAVEN principal investigator Bruce Jakosky on December 14th at the fall meeting of the American Geophysical Union. The particles associated with solar wind are typically deflected by a planet’s ionosphere, which is a layer of the upper atmosphere that has been charged by solar radiation and shields the planet. However, this method of protection diminished after the planet’s core cooled, and stopped moving in order to generate the magnetic field. As MAVEN dipped down into the ionosphere to take readings, its Solar Wind Ion Analyzer discovered streams of particles associated with solar wind that existed much lower into the atmosphere than was expected. It appears that while charged particles are deflected by the ionosphere, neutral particles are able to go much deeper. Unfortunately, these neutral particles can become charged within the lower regions of the ionosphere. These newly-charged particles act just like ordinary solar wind, and are capable of inflicting damage in the atmosphere as they punch their way out. Understanding how these particles are able to sneak into lower altitudes and become recharged will help scientists to explore if other layers of the atmosphere are affected in this way. Though the solar wind is contributing to the loss of the upper atmosphere, the lower atmosphere is responsible for climate, including the former responsibility of keeping the planet warm enough to sustain liquid water. MAVEN is utilizing the Neutral Gas and Ion Mass Spectrometer in order to see if the lower atmosphere has been affected by solar wind activity and if gas in the lower atmosphere is “leaking” into the upper atmosphere. MAVEN’s Suprathermal and Thermal Ion Composition (STATIC) instrument has detected ions leaving the Martian atmosphere. After they travel through the ionosphere, they have to bust back out through the shield meant to reflect them. Ultimately, many particles push through this layer at once, erupting out of the atmosphere, and leaving behind a hole. Over time, the measurements by STATIC will help determine the rate at which the atmosphere is being depleted. Understanding how the Martianatmosphere has evolved is important in our search for life beyond Earth, and thelatest research suggests that the Red Planet’s atmosphere is even more fragile than we thought. According to NASAs MAVEN (Mars Atmosphere and Volatile Evolution) spacecraft, when comet C/2013 A1 (Siding Spring) had a close encounter with Mars in October 2014, it sent the Martian magnetosphere into disarray, and gases were able to escape into space. Comet Siding Spring plunged the magnetic field around Mars into chaos, said Jared Espley, a MAVEN science team member at NASAs Goddard Space Flight Center, in a statement. We think the encounter blew away part of Mars upper atmosphere, much like a strong solar storm would. The magnetic field that surrounds Mars, its magnetosphere, is very weak. It is generated by plasma in the upper atmosphere interacting with the solar winds.Earths magnetic field, for comparison,is generated by the internal rotation of molten iron, and it is strong enough to protect us and the atmosphere. Comet Siding Spring is also surrounded by a plasma-induced magnetic field. As the nucleus of the comet is heated by the Sun, it releases a large amount of charged particles that create the atmosphere-like coma, which extends to over a million kilometers (more than 600,000 miles) from the tiny 500-meter-wide(1,640-foot) nucleus. At the closest approach, the comet was just 140,000 kilometers (roughly 87,000 miles) from Mars. The comets coma enveloped the entire planet, with the more dense regions nearly reaching all the way to the planet’s surface. This research, published in Geophysical Research Letters, looked at the consequence of this encounter, highlighting how the magnetosphere was affected. As the comet was approachingthe magnetic field began to realign towards it, but as the two objects got closer and closer the interaction was too intense for the flimsy Martian magnetic field. Without a stable magnetosphere, gases was able to flee the outer layers of the atmosphere. The main action took place during the comets closest approach, said Espley, but the planets magnetosphere began to feel some effects as soon as it entered the outer edge of the comets coma. MAVEN has already established that solar storms and solar winds have been responsible for turning Mars into a dead planet, by steadily blowing the atmosphere away. With MAVEN, were trying to understand how the Sun and solar wind interact with Mars, said Bruce Jakosky, MAVENs principal investigator from the University of Colorados Laboratory for Atmospheric and Space Physics in Boulder. By looking at how the magnetospheres of the comet and of Mars interact with each other, were getting a better understanding of the detailed processes that control each one. After roughly ten months of travel, NASA’s Mars Atmosphere and Volatile Evolution (MAVEN) spacecraft will be reaching the red planet and entering an elliptical orbit on September 21 at around 9:50 pm EDT. Thrusters will slow the spacecraft down, allowing it to be pulled into orbit over a span of 35 hours. After MAVEN begins its orbit, it will spend the first six weeks of the mission getting situated and performing various tests to ensure all instruments are working properly. Once all of the preliminary tests are done and MAVEN is ready to go, it will begin its science mission that is expected to last one Earth year. MAVEN’s mission will be to analyze the ionosphere and upper atmosphere of Mars and determine how it is affected by solar wind. More importantly, data collected by MAVEN will attempt to explain why Mars, which used to have an atmosphere thick enough to sustain liquid water on the surface, has almost nothing now. There has been considerable debate regarding Mars’s former habitability. Most of the support comes through evidence of liquid water, which is essential for life as we know it. What Did Mars Look Like When It Had Water? Mars is very aptly nicknamed “The Red Planet.” Aside from some dry ice polar caps, the landscape on Mars is cold, dry, and rocky. However, that wasn’t always the case. Four billion years ago Mars was covered in water. It had a much thicker atmosphere that kept the planet warm enough for rivers to flow and for liquid water to stand. On November 18, NASA will be launching the Mars Atmosphere and Volatile EvolutioN (MAVEN) which will try to determine what happened to the atmosphere on Mars. In the meantime scientists have speculated about what Mars may have looked like in its heyday. The crew from the Goddard Conceptual Image Lab has put together a video of what a flyover would look like if Mars were covered in water. Some estimates have claimed there could have been as much as 1640 feet (0.5 km) of water covering the entire planet. Liquid water is a vital ingredient for life and the potential for life on Mars has been hotly debated lately. The high-resolution video depicts the history of Mars over the last 4 billion years. The scene opens on a landscape covered in water with white, billowy clouds overhead. As the clouds begin to roll, it shows the passage of time. The atmosphere thins out, causing the water to evaporate. Gradually, all of the rivers and lakes dry up and the atmosphere is too thin to retain any of the sun’s heat. It ends with the Mars we know today: a barren, ice cold rock. There are a few leading ideas about what may have happened to the atmosphere on Mars which include asteroid impact and the loss of the magnetic field due to solar wind. According to the Mars Global Surveyor, Mars has not had a magnetic field in 3.7 billion years. MAVEN will reach the planet in September 2014 and will hopefully answer many questions about what has happened over the last 4 billion years to change the surface of Mars so drastically. Cheers erupted early this morning as India became the second nation in just two days to successfully slip a satellite into orbit around the Red Planet. The probe, unofficially nicknamed Mangalyaan (for Mars craft), is the fifth craft to join the Mars party which currently includes NASA’s newly arrived MAVEN and three other orbiters: Mars Odyssey, Mars Reconnaissance and the ESA’s Mars Express. Two NASA rovers, Opportunity and Curiosity, are also currently scampering across the surface. The Mars Orbiter Mission, or MOM for short, began its interplanetary journey on November 5, 2013, when it was launched from the Indian Space Research Organization’s (ISRO) Satish Dhawan Space Center atop a Polar Satellite Launch Vehicle. Despite launching several days before MAVEN, it arrived shortly after the NASA craft. Getting to Mars is no mean feat, especially for a developing country. Out of 51 attempts to reach the planet so far, less than half have been successful. What makes India’s achievement even more impressive is that this is only the second time that a mission has arrived at Mars on a maiden voyage. The first group to achieve this was the European Space Agency that reached Mars on its first attempt back in 2003. “Today not only has a dream come true, but we have created history for India, for ISRO, and for the world,” said Vipparthi Adimurthy of the Indian Institute of Space Science and Technology. Amazingly, India achieved all of this under a tight budget. MAVEN came with a staggering $671 million price tag, and the ESA’s Mars Express cost $386 million. MOM set India back a slightly more humble $74 million, but being thrifty has come with a few constraints. In particular, the amount of weight that the launch vehicle could carry was restricted, so the probe couldn’t take as much fuel as would be desirable. This means that the satellite has been forced to adopt an unusually elliptical orbit as there is insufficient fuel to tidy it up. Mangalyaan will now spend at least six months orbiting Mars, using five solar-powered instruments to gather data on the planet. Three of them are dedicated to atmospheric observations that may shed light on the disappearance of water and other molecules from the atmosphere. The other two are optical and infrared cameras that will be used to study the Martian surface and weather. MOM will also search for methane, a possible indicator of certain life forms or geological processes. The team hopes that the information gathered may help us better understand planetary formation and the history of Mars.